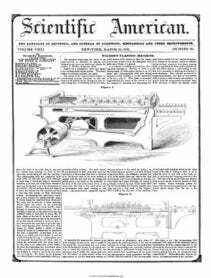 I took out a patent in March last for my machine noticed in the " Scientific American," July, 1847, and am now using the invention in connection with Hon. H. L. Ellsworth, of this place, for Kiln-drying Corn Meal and Ho miny lor shipment. The primary object in view in getting up this invention, was to kiln-dry with little fuel, and use steam as a regulator of the heat, to prevent scorching. In the old mode of using &apos;steam, much heat is lost from the arch, and also by conducting the steam at some dis tance from the generator (as is frequently the case) ; it is nearly condensed by the time it reaches the point where its influence is need ed. To remedy this, you will remember I pass the flues from the arch several times through the steam chamber. Some heat is al so lost by the old mode, in permitting the steam to escape in order to make room for a new and hotter supply. This is also reme died by making only steam sufficient to keep the box full, and keep up the heat by the flues from the arch. I did not, however, suppose I could heat the steam beyond about 212 with the small con finement which I used (there being always an open discharge at the bottom of the steam box for the steam to pass off when there was any pressure). But I soon found that I was ac tually heating the steam with only this small confinement, even to the point of ignition. Being engaged in the lumber business, I thought the plan a good one lor seasoning it, and accordingly put it at once into practice with the happiest results. I also applied the heated steam to seasoning barrel staves, by which I removed the sap from them in a few hours, and they would be fit to work with little exposure to the air, to expel the mois ture occasioned by contact with the steam. The staves thus seasoned proved to be strong er, and would dress smoother than those sea soned in the open air. Since the matter of heating steam without confinement was a disputed point, I determin ed to make a trial that would settle the mat ter. I had often set fire to wood by the steam, in making my experiments; but many were skeptical because the books were against it. For the purpose, therefore, of making a tho rough trial, I constructed a double box for the steam, and filled the spaces between them with saw-dust for a non-conductor. I then made an excavation in the ground of the size of the steam box, and of sufficient depth, into which I placed a stove (with about 40 feet of 7 inch pipe, to save heat), and then placed the steam box, without a bottom, over the excava tion, and banked the dirt up to it to keep in the heat. A pan of water was placed upon the stove to make steam to fill the box, the pan being supplied with water as often as it evaporated. I then weighed 1000 feet of green white wood lumber and placed it in the box, commencing four feet above the stove and pipe, to avoid the direct heat of the arch. The lumber was stuck up with lath between, to allow the free circulation of steam and heat through it. As the heat and steam were both generated below the lumber, they rose to gether into it,—the extra heat to liqueiy the sap, and the steam to keep the pores ot the lumber open for the sap to pass out, and also to keep the lumber from scorching in case too high a heat should be raised. It was there fore expected 1 should make a two-fold expe riment, viz., to ascertain whether I could sea son more rapidly than by the old method, and also to settle the matter whether I could heat the steam without pressure beyond 212 . Those who were skeptical said, if I could kiln-dry the lumber in four days, they would be satisfied. I built a fire in the stove (pla ced in the vault beneath the lumbtr) at about 5 o'clock in the morning, and kept up what would be equivalent to a good bar-room fire in a cold day. The box was soon filled with steam, made in part, doubtless from the green lumber, and sooner than many persons would imagine (from the small amount of fuel used) the lumber was evidently hot—indicated by steam, which at times forced its way out through the box. In about 12 hours from the time of making the fire, viz., at 5 o'clock in the afternoon, I discovered smoke issuing from a point in the kiln about midway of the lum ber, at a place where, at times,iduring the d ay, I had seen small quantities ot steam escape. Since the lumber could burn no faster than air was admitted at that place, I partially closed the aperture and continued the fire about an hour longer—then opened the kiln, extin guished the fire (which had burned but a few feet), and removed the lumber, while hot, in order to permit its own heat to expel the moisture occasioned by the steam. When the lumber was cold I re-weighed it, and found I had diminished its weight 1200 lbs. and actual ly set it on fire with the steam ! On examining the lumber the skeptical gen tlemen acknowledged it was well seasoned, or at least that the sap was all removed, and proceeded at once to prepare it for construct ing a building. But I do not intend to season thus rapidly, nor do I think it policy, for the benefit of the timber, to raise the steam to so high a heat, and tor reasons which will appear hereatter. But that the steam was raised to the point of ignition I will proceed to give the evidence. The stove was so arranged that no sparks could issue from it into the lumber above, and the pipe was not only sound, but the joints were cemented, thus avoiding the possibility of setting fire to the lumber by means of sparks. Then add to this the improbability of a spark passing four feet through dense steam before reaching the lumber above the pipes, and then passing in a zig-zag course, through sixteen thicknesses of boards, stuck up as before-mentioned, before reaching the point where the fire commenced,—and the im possibility of the fire being kindled by the sparks will be settled. The known fact that steam, however hot, will not ignite without being supplied with air, is also another evidence that this was done by the steam ; as the fire took at a place quite distant from the arch, and at a point where a crack in the box admitted the air and dis charged steam. At the same time a board, making a part of one end of the vault beneath and placed only one foot irom the stove, was neither colored nor scorched by the heat, as no air was admitted at that point. I called the attention of many scientific men to the expe riment, and none expressed a doubt that the lumber was set on fire by the steam. You doubtless remember the report that was made to the Academy of Science, in Pa ris, a few years since, by a M. Viobelta, of some experiments which he had made in the seasoning of lumber by a high heat of steam. He placed some pieces of the different kinds of wood into a steam boiler, and then raised the heat by means of pressure to 480 . The pieces thus seasoned he afterwards submitted to the test, in cennection with other like pie ces, not steamed, and found their susceptibility to resist fracture had been increased by this seasoning (in the different kinds of wood), from 2-5ths to 5-9ths, besides causing them to receive a higher polish. Lumber seasoned by steam has many ad vantages over that seasoned by hot air, since the steam removes the sap, which is one of the great causes of the shrinking, swelling, and warping of lumber, while the hot air dries this sap into the lumber, and causes the lumber to be brittle, liable to shrink, swelli and warp, as well as diminishing its strength and value for building purposes. Lumber can be seasoned as much in 24 hours by steam at 500 as in a common board kiln in two weeks, or in the open air in six months. I will name some some of the advantages of the heated over the common steam in the kiln-drying ot grain,flour, and meal. By my process you will remember the grain, &c, is passed back and forth through the dryer, by means of conveyers, inside of tubes ; in order to successful ventilation (a point otten over looked) both ends of the grain tubes are left open, and as often as the grain is conducted 6 feet, inside of the tubes, which are surrounded by the heated steam, it is conveyed 2 feet en tirely in the open air, for ventilation. By the ordinary heat of steam, it would he impossi ble to keep up a sufficient amount ot heat in the tubes to dry rapidly and successfully, un less bv greatly increasing the size and expense of the machine. It is a great saving of fuel, since the heat ing of the steam is performed by the escape heat from the arch, and instead of making steam continually to supply the plae ol that which has given out only a few degrees of heat, and has passed out into the air, or has been condensed ; the escape heat is applied, which, in a great measure, keeps the steam from condensing, and even when allowed to condense, it returns to the pan beneath, to ' e again raised in steam as needed, without the loss ot heat. Another advantage is the sus ceptibility of steam to take up and hold seve ral times its own amount of heat as latent, and thus when the flues passing through the steam chamber become overheated, it takes up the heat and holds it as latent, to be im parted to the grain tubes as needed, while, at the same time, it acts as a regulator of the heat to keep the tubes from scorching the grain, meal, &c.,in its passage through them as is otten done in the case of hot air. In the heating of rooms, also, by steam, a great gain will of course result from starting the steam on its mission through the building freighted with five or six hundred degrees of heat, rather than the usual heat of 212 . The drying bf paper could be greatly facilitated in the paper mills, by using this means of rais ing a high heat of steam, as the steam would be thus required to give out several hundred degrees of heat before it is condensed. Green peas, corn, and beans can be rapidly dried by this process without danger oi scorch ing or coloring, and without the trouble of changing from the oven to the air and air to the oven. I have taken 21 lbs. ot water from a barrel of meal and 15 lbs. from a barrel of flour, and the flour, when baked, made more and better bread. Corn may be kiln-dried in I he ear (in the early part of the season) sufficiently to make it shell, by putting it into the lumber car, which is placed on a track running through the dryer. The lumber is stuck up on the car, and the car is then run into the dryer, by means of double doors at each end, the doors are closed, and the lumber is steam ed on the car, and then passed out at the other end on a track, and another car is run into the dryer. Thus no time is lost, and the heat of the kiln is not wasted by being long kept open. H. G. BULKLEY. La Fayette; Ind., March, 1853.